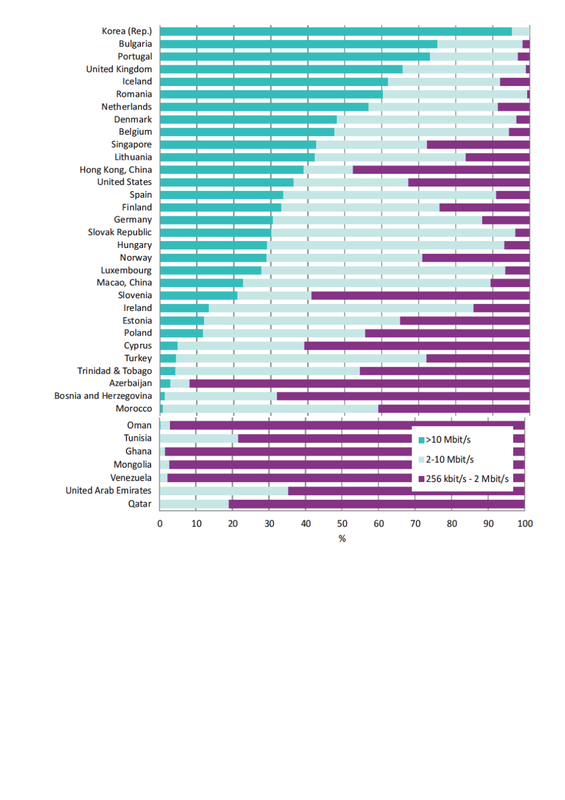 Some people have been shocked by the ITU’s publication of figures showing that the UK ranks fourth in the world for access to high speed broadband, with most Brits have access to broadband speed of 10Mbps or more (see table). In fact the document notes that a recent study by the regulator Ofcom showed that actual speed were about half those advertised, especially for those with ADSL access. “FCC (US Federal Communications Commission) has come to the same conclusion in the United States,” the ITU notes. The ITU stats department said data on fixed (wired) broadband subscriptions are collected according to advertised speeds. Ofcom was the source of the UK data. “These may very well differ from actual speeds,” the ITU said. Which is an admission that the figures may not be very helpful to anyone, including consumers, who would like to know whether they can actually receive a quality service for which they are being charged. Another ITU example, that of Bahrain, showed that actual speeds delivered on a 2Mbps service were always below 2Mbps, and just 1Mbps at peak times. “It is technically very challenging to measure broadband speeds and quality accurately, but we are discussing the subject within the ITU expert group on telecommunications/ICT indicators (EGTI), with a view to finding additional metrics to refine the measurements,” it said. The ITU said low speed fixed wire broadband subscriptions (256kbps to 2Mbps) made up less than 2% of total UK subscriptions. ITU doesn’t collect figures on subs below this speed because it does not consider sub-256kbps to be broadband. “This may explain why some rural internet subscriptions are not included in these figures,” it said. If ITU used actual speeds experienced by consumers, especially on uploads, it might discover there are a lot fewer broadband subscribers too. That millions are not getting the service they pay for should be a growing concern for regulators, politicians and civil servants who set targets, place contracts and pay broadband delivery bills. As many have said before, it is one thing to promise Britons a universal 2Mbps service; it is another to deliver it. To promise, to take the money and then not deliver, is fraud. When so many regulators recruit their staff from the telcos there is a danger that they will over time become biased towards their former colleagues. The UK’s Financial Services Authority, which recruited most of its staff from among bankers, shows where this leads, and the cost to the country. What countries need are tough-minded, independent and experienced communications regulators. But where to find them, and where do they get their training and experience? Perhaps, as with World Cup referees and umpires, the answer is to recruit the best from outside the country. « Fibre to the business? Bring it on! So rubbish from the ITU and rubbish from U-Switch! I think you missed the bit about where ITU got its information. Always check your sources. Besides, at least ITU knows about the problem and is trying to do something about it. Will it be able to? Depends on governments. Do we trust governments to do the right thing? Of course we do. Ian I assume your tongue was in your cheek when you said that!! Nobody has yet come up with a way of handling rate adaptive services in these surveys. While approaching 50% of the UK population have the option of Virgin Media cable with 10, 30 and 50Mbits/s fixed rate services the rest are using rate adaptive services where you have to dig somewhat to find the connection rates that prevail in practice. Data does exist, and OFCOM could up its game to procure such data. See for example http://www.samknows.com/broadband/news/isps-reveal-line-speed-data-792.html the Plusnet link is still live. I would agree that headline speed is of limited value in rate adaptive services, but speedtests run on low cost highly contended services are also of limited value if one is trying to measure the installed technical capability. Good points Phil. But what counts is the customer’s experience. The technical issues determine the best he or she can get, so the details should be available should anyone wanst them. But they are all out of the user’s control, so users are left with the experience. If that’s not up to par, they are always going to feel disappointed and disaffected. Not good customer relationship management, unless you don’t care.